Power From The Core | Mediterra - Swim & Run Better Than Ever! Today’s post is taken from my response to a dedicated TI swimmer friend in Sweden. She sent some videos clips for me to examine as well. “Could you please give me some advise on how I can get the whole body working when I swim? I feel as if I am just swimming with my arms and a little bit with the legs. I need to use the hips etc better but I do not really understand how to do this? I really appreciate questions like these, and the challenge of trying to advise with words instead of with live coaching. After looking at her video clips I can see that she has pulled the pieces of her stroke together, and her timing is better than I’ve ever seen it. She has obviously been working on it with great attention. Now she has become aware that she is not getting the power she knows she is entitled to from the great technique that is taking shape. Since she has the timing in place what needs to take place now is to re-channel her power from shoulders to core. It will be much easier at our OW camp for me to show you how to hold the water with your arm and rotate around. But I will attempt to give some explanations and ideas for you to practice on your own until then. Here is an experiment you can do on the ground. Have a friend stand in front of you on the floor a little less than a meter away. Stand facing him/her. Reach your right hand out to grab his right wrist and using ONLY your arm, begin pulling him to you. Now do the exact same thing, but this time, hold his right wrist with your right hand and instead of pulling them with your arm and shoulder muscles, pull him toward you by rotating your torso to the right. Pull with your torso rotation, not your shoulder muscles. Can you feel the difference in where you are empowering the pull? The first exercise has you pulling from the shoulder. The second has you pulling using the torso rotation (or, core rotation). What you are doing is consciously changing where you are pulling from- where you are directing power. You will feel a change in which muscles are working ‘harder’. 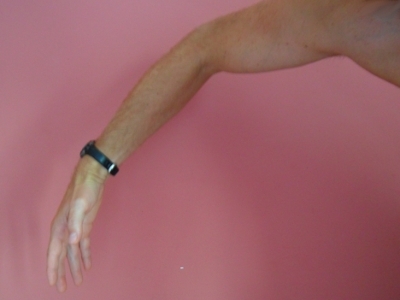 Instead of the small Deltoids around the top of the arm and back of the shoulder feeling like they are doing most of the pulling work, you will feel the large Latissimus Dorsi muscles doing the pulling work, while the Deltoids are just ‘holding’ the arm in position, not pulling (so much). There is a reason we call this part of the stroke “the Catch” instead of “the Pull”. It is a critical distinction and is part of the difference between good swimming and amazing swimming. We are catching the water and holding it, while we propel the body forward. We are NOT shoving or pulling water backwards. From the perspective of hydro-physics that is exactly what we don’t want to happen. I see this commonly in developing female swimmers (and rock climbers)- that there is a strong emphasis on the legs while having what seems to be a delicate use of the arms. I suppose this is because women instinctively don’t rely on upper body strength of the smaller arm muscles as much as men. Yet the key for women is not to work with those small upper arm and shoulder muscles but to work from the core rotation and let the large, relatively tireless back and core muscles do the work instead. If you were to swing a tennis racket, you would do it by rotating your core. There would be no power in an arm-only swing. I think most people can sense this right away. If you were to sit in a kayak and take a stroke with the paddle, you would quickly realize that pulling with the arms will make you tired almost immediately. Instead, you anchor your bottom snuggly into the seat, legs pinned against the frame, then plant the paddle firmly in the water, and then apply pressure to the paddle face, turning your torso, to slide the kayak past the point being held by the paddle. You are transfering leveraged force from the paddle face, through your core rotation, and directing it into the frame of the kayak. The rotation of your core acts like a piston in the engine of an automobile. You don’t paddle by pulling from the shoulders alone. The shoulders are still working, but as ‘support’ for the pull, not the main power behind it. In the Catch (formerly known to you as the Pull ) there are a few things we can do to help your brain direct power from the core. This is a hard one for me to describe without showing you in the pool. But once I show you it will instantly make sense. If there were a piling or post in the water in front of you, and you were to swim past it- I would have you time your catch so that your catch hand and forearm would set right on the surface of that piling, and as you take a stroke. Instead of the catch hand pushing back in the water, you would push off of that piling to cause your body to slide forward, past the piling. The piling is fixed- it cannot move. So your catch hand cannot slip back in the water. You have to slide your body past it. This is ideally what we would like to achieve with each catch. This is precisely what the best swimmers in the world are accomplishing. Their catch hand actually exits the water in front of the point where they first began their catch! Now there are two ways to slide your body- using the smaller shoulder muscles to just pull the body forward. If you do this you will feel the water resistance built up against your head and shoulders, and how much more power you need to generate to overcome it. OR you can use the core rotation of your body, at that exact moment when the catch hand and forearm set on the piling, to slide your body past the piling, in a cork-screw like rotation motion. Since you, as a TI Swimmer already are trained to hold a patient front arm, your other arm will already be in place in front of your head to cut the water in front of you while executing the rotation. This lead arm already in place at the moment of the catch creates the low pressure zone for the rest of your body to slip through (what I often refer to as the Active Streamline moment). Since you don’t have a piling in your pool the first way we do this is by having someone stand in the shallow end of the pool and pretend to be a piling (I usually stand sideways so I can plant my legs spread apart on the bottom of the pool so the swimmer does not easily push me over). Then you swim past your human-piling and plant your forearm on their leg as the catch point and use that leg to slide past. The next step in this drill (or if you have no corner or human-piling to work with) is to do it without a human-piling. Lay down into Skate Position, preparing to take some strokes, then you set the catch hand and forearm, and as carefully as possible, attempt to hold your hand in that exact position in the water without letting it slide back, and use your core rotation to slide past that point. It is very tricky at first, but even as you move slowly it is excellent neural training. This causes your brain (it tricks your consciousness) to solve the problem of forward propulsion in a new way- by sliding the body forward, instead of pushing water back. You have to use core rotation (Latissimus Dorsi and Teres Major muscles, and the muscles all the way down your back and abdomen) to do this. Of course, while you do this so gently in the water, you are not creating so much propulsion. The objective here is to awaken your conscious control of where you are drawing power from. Your are awakening a new neuro-muscular (motor) control circuit, learning to recognize it, strengthen it, then add power to it as you are able to control it. As I remind you often- Precision Before Power. Terry calls this ‘Hold the Water and Slide The Body Past’. This is a hallmark of a well-developed swimmer with a finely tuned long stroke. They are able to hold the water with the forearm and swim past that point in the water. It happens because they are ‘slippery’ not powerful- they have learned to use the core rotation to slide, rather than shoulder muscles to pull. Of course, a swimmer could hold the water poorly and just kick past that point, but that would be defeating the point of the whole skill building drill. By limiting ourselves to a 2-Beat Kick we require ourselves to develop full-body synchronization- power flowing through the body from toes to finger tips- the superior form of propulsion by far. You may now be ready to add fist swimming to your normal practice diet. It is a main-stay of my practice because it is so effective in strengthening my full high-elbow, full forearm catch. When done well, after a swimmer has caught the ‘stroke with the torso’ concept Fist Swimming will further strengthen that circuit. Basically, made your hands into fists and swim that way! I did buy some ‘Fist Gloves’ at one time but found them to break after not too long, and actually quite unnecessary. You can make a fist by squeezing your thumb or just resting it beside your curled fingers. You can even take marbles along to the pool and hold this in your fist to help you hold a fist consistently. Once you begin taking strokes with a fist you will notice that your hands have suddenly gotten very small! This compels you to make full use of your forearm. So that is the first focus point- use the entire forearm to hold the water as you slide the body past. The next focus point is to keep the elbow pointed out sideways. This enables you to start the catch as far in front of the body as possible. This is the starting point of the vertical forearm catch. But begin to develop this slowly and very carefully- it requires a new orientation for the shoulder joint and must be gradually conditioned to safely transfer power. Be gentle at first. Go only as far as you remain comfortable in the shoulder joint. Do not be aggressive and extreme about the vertical forearm- the main concern is to keep the elbow pointed sideways and NEVER pointed down. The next focus point is to use that forearm and fist to hold the water and slide the body past. Since your ultimate objective behind the original question is to start getting power from your core this is where each of these drills are designed to take you. The swimming will be slow as you begin to focus on each detail, but you will be strengthening the systems needed to swim faster, easier, with less power than you have been using. When you get to camp we will be able to work on these further. With the advantage of no walls- with the opportunity to take hundreds of uninterrupted strokes- you will more easily be able to detect and adjust how power is flowing through your body, and transfer the work to your back and torso, and away from the shoulders that tire easily in distance swimming. Walls interrupt this process. I attempted to give her a start on practicing on her own until she comes to our OW camp in just over a month. Perhaps this is a good start for you as well. After you attempt to follow these instructions send me more questions so I can improve the explanations. Hi Matt! Is it possible to guess how much difference there are between a good and a bad catch, if counting SPL and if other factors are equal? Great question! To answer that question in the simplest way, if you’ve got a steady SPL and a steady Tempo, these means the ‘gears’ a fixed for a certain Pace. Now the question is, how can you make it easier to hold that SPL and Tempo? This is such a good and practical question I think I will write a post just for this answer. I am not sure how well the comments will be scanned and I would want this answer to get in front of the eyes of those who need it. To start, your post in core power is fantastic, with a lot of information to take to the pool. I have been practising TI for about 3 years now, with my drills coming on recently with my new found better balance (tummy in, chest out a bit). However, when I transfer thus to whole stroke, I am still doing about 19 spl for 25m, which is giving me about 7 1/2 minutes for 400m. I would like to get to a consistent 18 spl, at a TT if about 1.3, which will bring me down to around 7 minutes or under. What I am lacking is propulsion, especially on the catch. From your great post, am I right in thinking when in catch I hold it there a split second and swim past it ??? I pull, and don’t catch or hold the water, and this is one of the things that my swim is lacking. Is it a matter of patience in holding the water ?? Then core to move past ?? Thinking about your post makes 100% sense, but not easy to achieve !! Look forward to your thoughts and many more of your posts!! Thanks Russ! I am excited to have something useful to give. Here’s my reply, http://wp.me/pR9zj-iK where others can find it more easil.